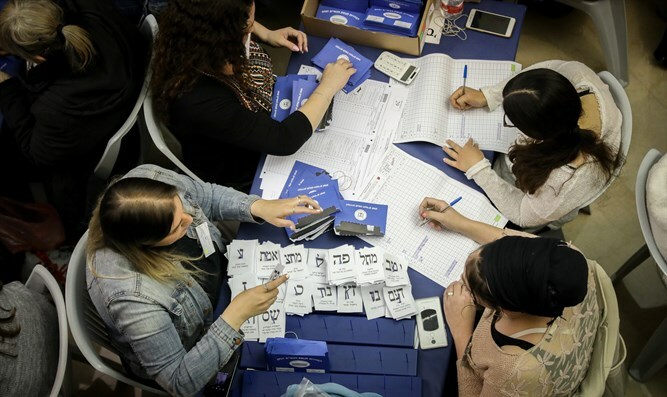 Central Elections Committee says New Right party 'misrepresenting' irregularities in vote counting in bid to make it into the Knesset. "As of Wednesday, 10.4.2019, immediately following the election day, the most senior representatives of the New Right began to be in contact with senior officials in the Central Elections Committee to clarify their claims," ​​the committee said in a special statement. The committee also noted that the chairman of the Central Elections Committee, Vice President of the Supreme Court, Justice Hanan Melcer, allowed the representatives of the New Right to review material from the special ballot boxes. "Moreover, every approach by the representatives of the New Right, by any means, was examined immediately upon receipt and without the need for formalism and forms." "In view of all this, the Committee views with great severity the dissemination of the misrepresentation by the New Right that there were irregularities in the counting of special votes and the failure to recognize the Committee's attempts to provide them with the necessary information." This morning, the director general of the Elections Committee, Orly Ades, rejected the claims regarding the results of the elections. In an interview with the Kalman Lieberman program online, Adas said, "Unfortunately, there were two technical failures in the computerized system that resulted from the computer company that gave us the computer services, which caused incorrect data to be presented." Adas explained in an interview to Kalman Liebeskind and Prof. Yuval Elbashan that "the objective of transparency, in which we allow all the results of the elections to be presented in real time, is to enable parties and citizens to examine the results and draw our attention to possible mistakes. Naturally, at the end of such a busy day, there may occasionally be human error." "When you copy the results from the vote counting sheet to the record, there may be a shifting error that causes the result to be listed in the next list," Ades explained. "In exceptional cases, we invite all the material of the same ballot box to take out all the ballots, the counting sheet and tell exactly what happened." She referred to the possibility that the New Right would pass the threshold when the official results were announced on Wednesday. "Because of the very small gaps, there is a possibility, but not only for them, that there can still be changes here or there," she said.